"It took me years, but with practice and dedication you can make any spirit every bit as good as a commercial distiller," says Dave Robison, 42, owner of Pioneer Spirits, a single-batch distillery in Chico, California. "You might not be able to reproduce it exactly, but it will be as good as anything you can buy on the top shelf." Today, making your own liquor is as illegal as ever, and a lot less lucrative. In fact, it's considerably cheaper to buy it off the shelf. As a result, today's home distillers are quintessential do-it-yourselfers. Many are engineers and techies, much like the liquor connoisseurs who attend the Whiskies of the World Expo each year in San Francisco. "We have a whole audience that we refer to as the whiskey geek," event founder and organizer Riannon Walsh says. "I think 90 percent of them are techies." John Spidell misses the moonshine tradition. A former federal revenuer, the 65-year-old spent the first half of the '70s "busting up" illegal stills in North Carolina. His job sometimes required living in a sleeping bag under a piece of canvas for weeks at a time, watching a big still, waiting for the owner to appear. Smaller stills got less attention. Spidell was blowing up simple pot stills, which were used to distill mash made from sugar, water, yeast and hog "shorts" (corn feed for hogs). After it was fermented, the mash would go into the boiler, where it was heated. 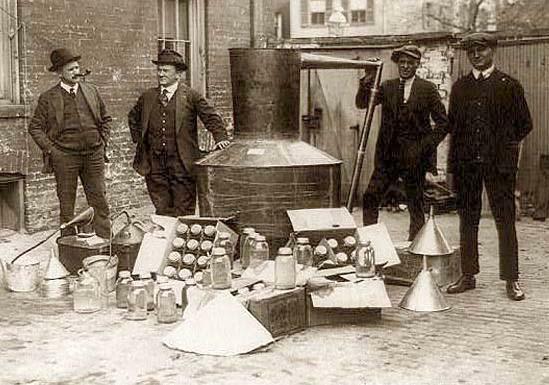 Bootleggers delivered the illicit liquor to "shot houses" in the cities on Wednesdays and Thursdays, ensuring they were stocked for the weekend. Today's home distillers are more likely to build a small reflux still and hide it in the garage. Unlike a pot still, the vapors rise through a column packed with copper wool or another high-surface-area material before being directed into the condenser. A beer keg makes a good boiler, and a homemade column and condenser are within the reach of anyone with basic welding and soldering skills and access to copper pipe. The packed column makes the reflux still more efficient than a pot still, so it produces a higher-proof spirit on the first distillation. Still, the average home distiller isn't making any money on the endeavor. "People are trying to keep a tradition alive," Robison says. "They're not selling it. That's looked down on in the home distilling crowd. Most people I know aren't making more than a gallon at a time. Some people on the forum come from the moonshiner tradition, and we've learned a lot from them. But I've never met anyone who makes it for money." Robison runs the popular Home Distiller forum with more than 2,000 registered users and 50,000 unique visitors per month. Other online home distilling resources include Smiley's Home Distilling and American Distiller. The concept may be simple, but high-quality home-distilling isn't exactly easy. The moonshine tradition spawned a lot of misinformation, which Robison tries to rectify on the forum. First and foremost, he makes it clear that home distillation of liquor is illegal in all 50 states and just about every country, save New Zealand. Besides being illicit, white lightning has earned a reputation for blinding and killing people who drink it. Many sources attribute these effects to methanol ("the heads"), which boils off naturally during an early stage of the distillation process. "The heads will make you blind if you drink it, but I defy you to try to drink it," says microdistiller Michael Heavener, co-owner of Highball Distillery in Portland, Oregon. "If it doesn’t make you wince when you smell it, it's probably not going to make you go blind." The real culprit in poison moonshine was usually radiators, according to Spidell. "Copper coils are not the most efficient condenser. If you're making 10,000 to 25,000 gallons at a time, you might immerse a truck radiator in the water. Chemicals in the moonshine leach out lead salts from the soldering. As a result of that, here comes the lead poisoning." Made properly, home-distilled spirits are as safe to drink as any commercial liquor. Still, Heavener warns, "I'd be more concerned with the danger of explosions." Even innocent mistakes -- such as using lead soldering or plastic parts in the still - can lead to serious consequences. So Robison encourages would-be home-distillers to do their homework first and make liquor later. After all, he says, "This ain't stamp collecting."